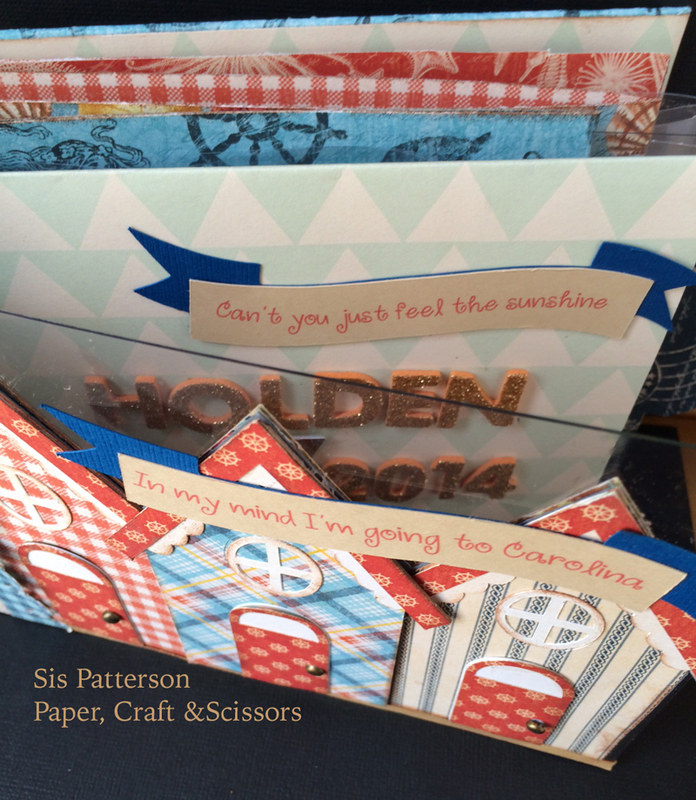 Many of us now use our phones and tablets for photo viewing and virtual scrapbooking- but sometimes, you need a little paper joy to share with others. Here is my take on a quick and easy project to make an accordion fold album that is just the right size for Instagram photos and other little photos or paper tidbits. Here it is open – you can either flip pages like a book or expand it out. 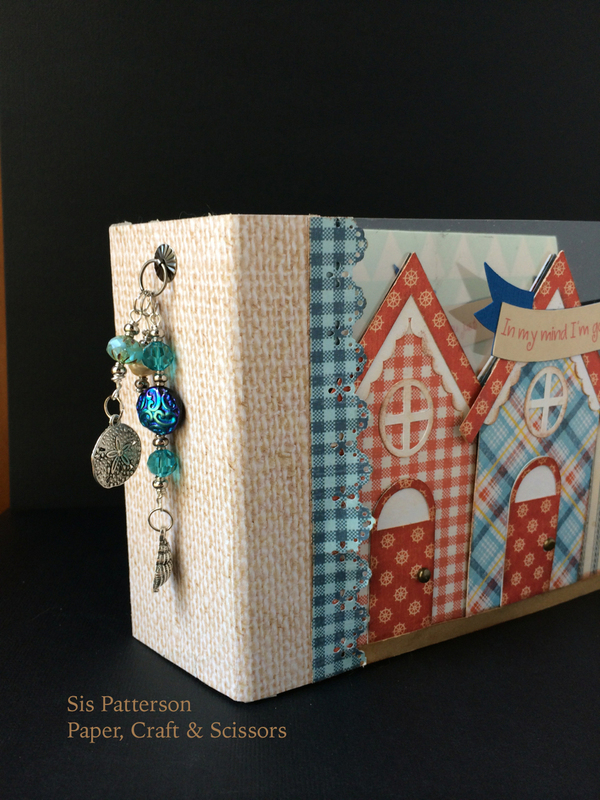 You can make this project with a few pieces of chipboard, a half a piece of patterned 12” scrapbook paper for the outer and inner covers, and one piece of 12” solid color cardstock (medium or heavy weight) for the accordion fold. You could also use a patterned piece of cardstock for the accordion fold but make sure it is medium or heavy weight cardstock so that it will hold the weight of your photos or other flat memorabilia. I used this wonderful little accordion fold album here as the foundation for my book and fiddled with it until I came up with the project I am sharing. Want to make one or a whole bunch? Here’s what you will need to gather to make one. Step 1 – Cut two pieces of heavy weight chipboard 4.5” tall by 4.5” wide. With a pencil, mark the vertical direction with an arrow in the center of both the front and back covers of the chipboard. 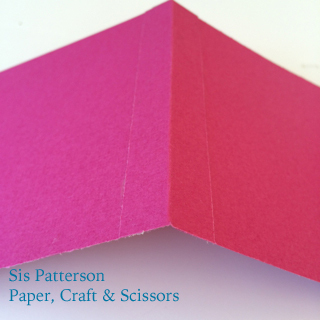 This will help you ensure your pattern paper gets adhered in the direction you want. 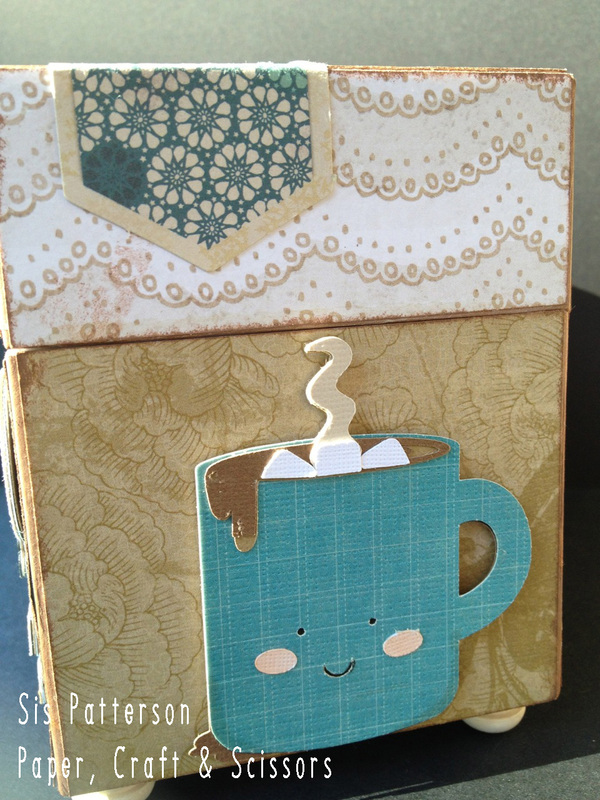 Step 2 – Using your patterned paper, cut two outer cover pieces 5.25” tall by 5.25” wide. Cut two inner cover pieces that measure 4 3/8” by 4 3/8”. 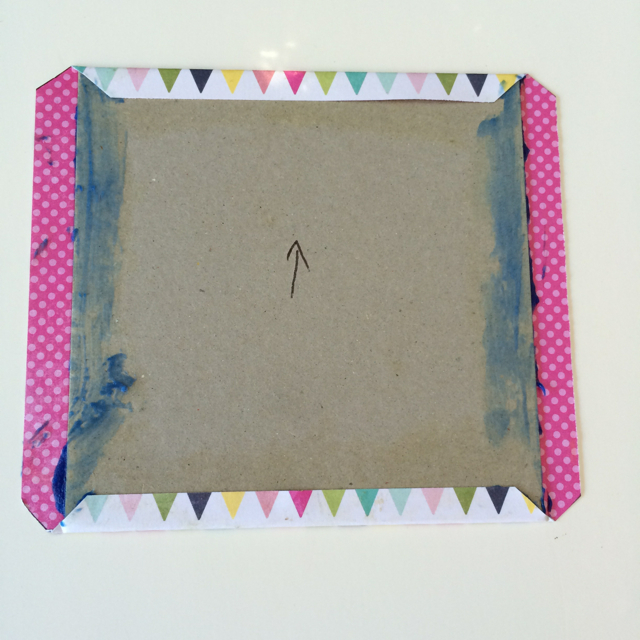 Step 4 – Place 5.25” square patterned paper right side down (wrong side up) on a firm surface. Take the gluey-side chipboard cover piece and center it on the patterned paper (the patterned paper is wrong side up and the gluey side should be facing down). Adhere. Flip over and use your bone folder to burnish your cover. Repeat the same process for the back cover. Step 5 – Using your ruler and a pencil, mark a 45 degree angle on the patterned paper about 1/8” from the edge of the chipboard at each corner. Trim off the “ears”. Step 6 – For each cover, very lightly score around the edge of your chipboard piece. 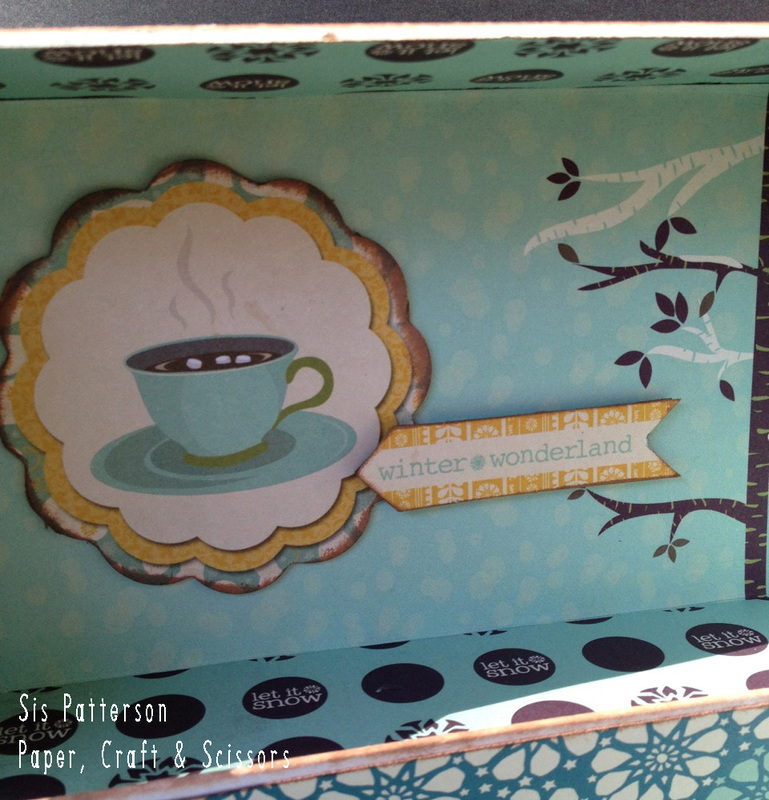 Use the side of your bone folder to push the edge of the patterned paper over the edge of the chipboard. Step 7 – Add glue around edge of chipboard and fold the paper in to cover the chipboard edge. Hold edge while glue dries and then move to next edge. Here is a peek of the work in progress. Repeat for the back cover piece. Step 8 – If you are adding an eyelet, use your Crop-a-dile or eyelet setter to set an eyelet about an inch from the right hand edge of your front cover. Remember to check that your pattern paper is heading up and punch your hole from the front. If you are not adding an eyelet, you will simply extend the ribbon out on both sides of the chipboard in Step 9. Step 9 – Lay front cover patterned side down on a firm surface with the eyelet to the right. Find the center of the cover and make a mark. Adjust ribbon so that the end going towards the left (eyelet side/right front side) measures 12”. Adhere ribbon to the inside of the front cover using ScorPal tape or other strong double side tape. In the photo below, the eyelet is pictured on the left because the cover is face down. Step 10 – Center and adhere the inner front patterned paper on the inside covers. Step 11 – Using the solid color cardstock, cut two 4” wide strips (12” long) and score at 4” and 8”. Accordion fold the two strips. Step 12 – From the remaining color cardstock, cut a 1” wide and 4” tall strip from the remaining cardstock. Score down the middle and fold in half. Place quarter-inch ScorPal tape on the two inner sides of the folded piece. Step 13 – Remove one of the paper cover strips from the ScorPal tape, line up accordion strip and adhere to end. Remove second piece of paper cover strips from the ScorPal tape and attach to second accordion strip. This joins the two 12” strips together. 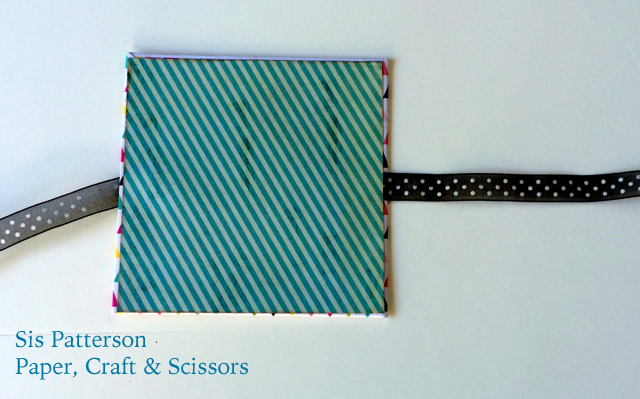 Step 14 – Arrange accordion fold so the first and last folded edge is on the left. Place a generous amount of ScorPal tape on the first and last page. You can check to see if this is correct by flipping through the accordion fold like a book (pages will flip left to right). You should have 3 folds on the left and 2 folds on the right. Step 15 – Place back cover face side down and line up accordion fold so the fold edge is along the vertical outside edge of the cover along the edge of the inner cover paper (do not remove paper tape covering yet). 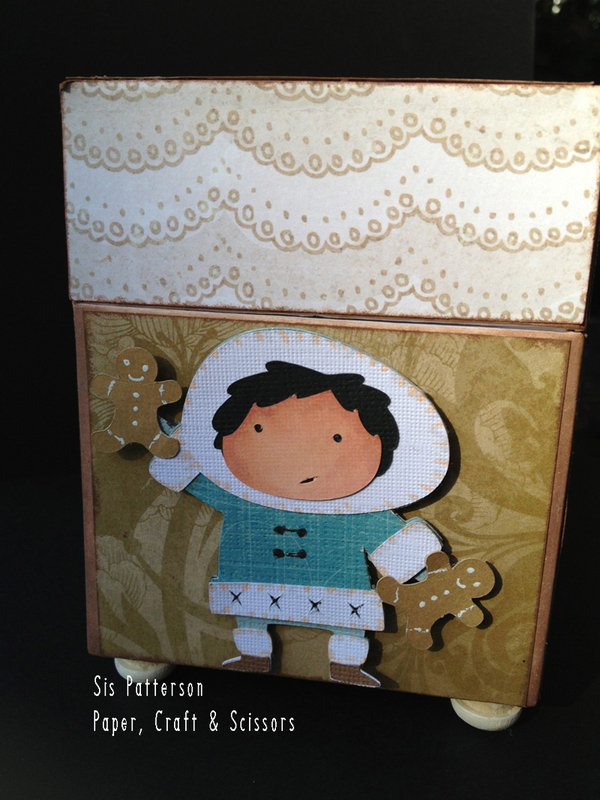 The accordion fold should be centered top to bottom (1/8” of the inside patterned paper wrap visible). There will be about a 1/4″ inch space to right edge (as you look down). Open up the fold and adhere the back page to the inside back cover. 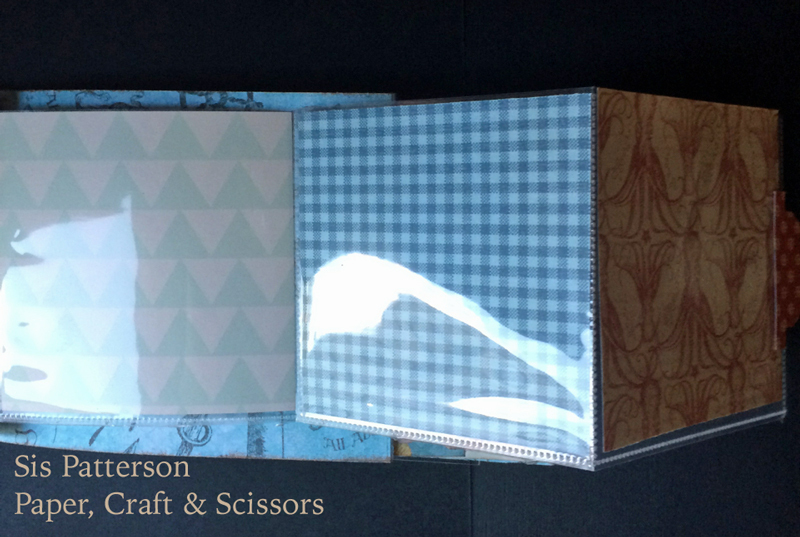 Step 16 – Place the two covers open side by side with the cover with the attached accordion fold on the right. The ribbon from the front cover should extend underneath the back cover. 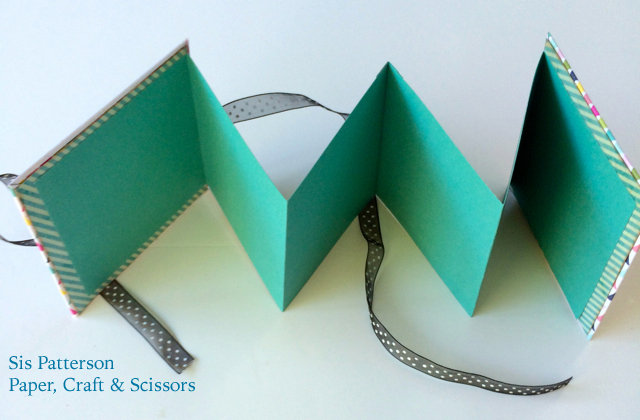 Take the front cover and practice aligning it with the accordion fold. You should have a nice clean folded edge right along the edge of both covers. When your covers are in a straight line and you have verified that the accordion fold is along the outside edge of the back cover, you are ready to remove the paper covering from your tape. Once removed, place your front cover directly on the accordion fold (in a nice even movement keeping alignment with the back cover). Your covers should align. Press firmly. 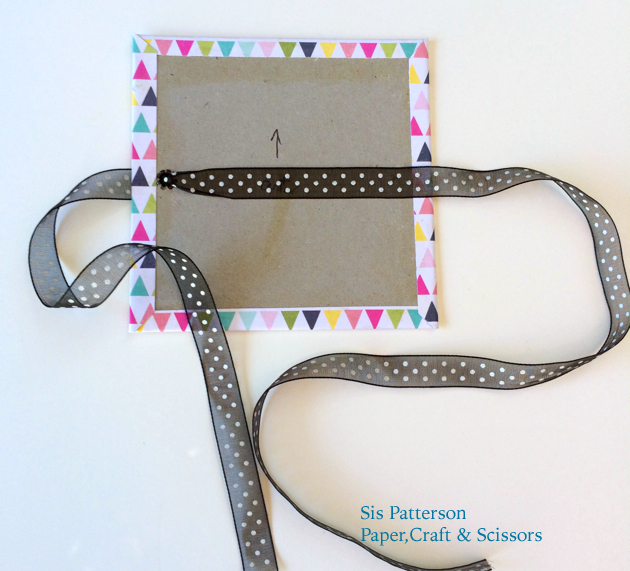 Step 17 – The ribbon from the left side of the front of the book wraps around the back of the back cover and keeps your book together. Tie the ribbon and trim as needed. 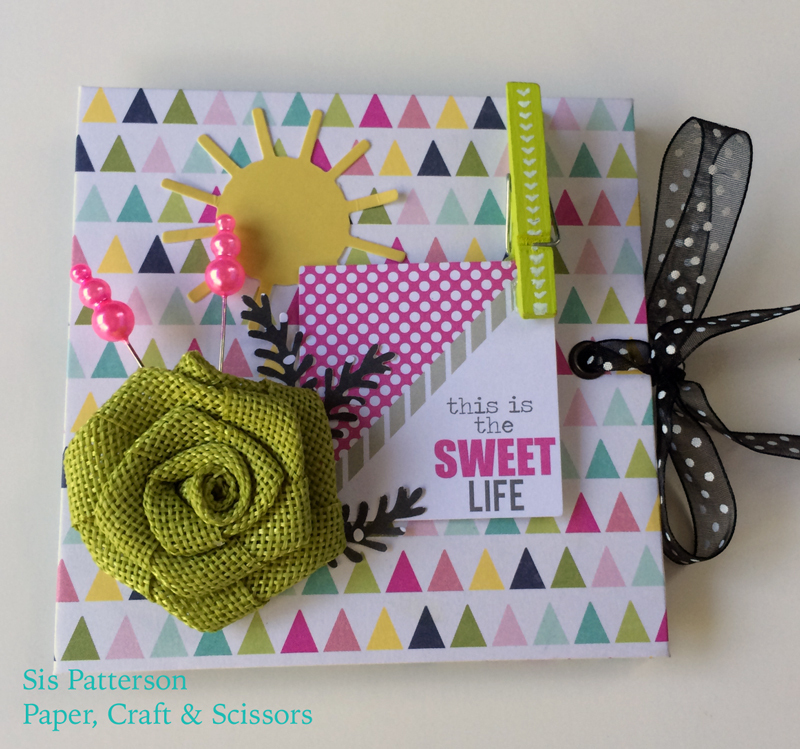 Step 18 – Decorate the front of your book. You can also decorate the front and back pages of your accordion fold and add pockets and tags if you want. You can use your electronic die cutter (like a Cricut or Silhouette), make your own embellishments, or use a paper company’s embellishments. Add a name, initials, date, tag, or flower. Have fun! I used my Cricut Explore and the awesome Small Talk and Frames cartridge to embellish this accordion fold mini album. The first one used embellishments from my Noel Mignon kit (less the polka dot ribbon). On both, I added punched foliage (using a punch bunch). 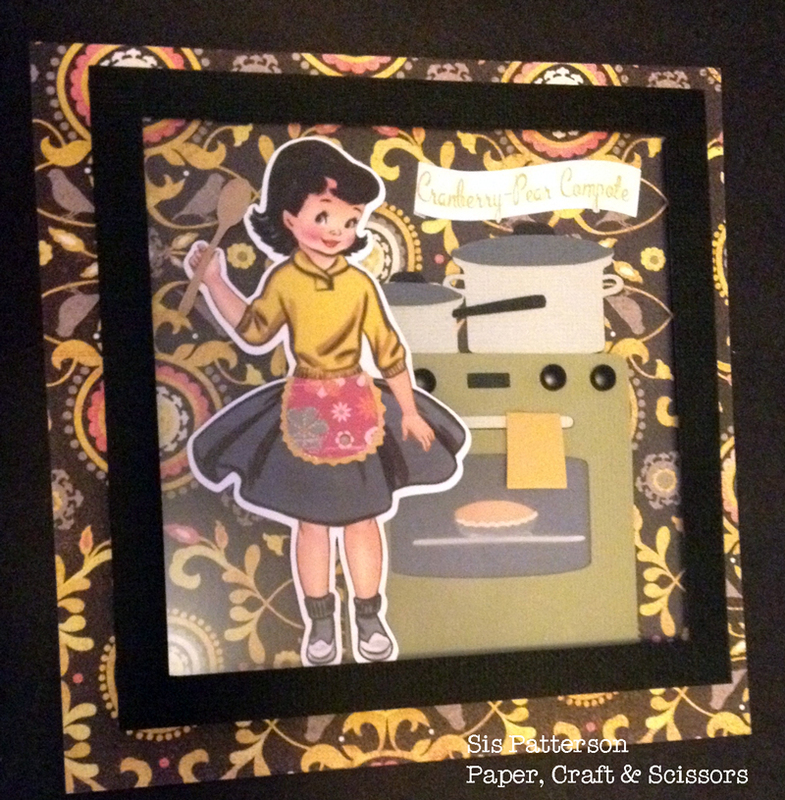 You can finish your inner pages to add pockets or patterned paper mats. Here’s a great tutorial on another small book that uses signatures instead of an accordion fold. Edited to correct step 15. I made a little Graphic 45 “Down by the Sea” mini album to capture a week-long vacation at the beach. The structure of my book is Kathy Orta’s hidden hinge system. It may take a while to watch the video and understand, but believe me, you can do it! Here is the link to Kathy’s tutorial. There are other tutorials available for making the cover. And here is the 5″x7″ mini album I made. It has a clear acrylic cover and chipboard back. 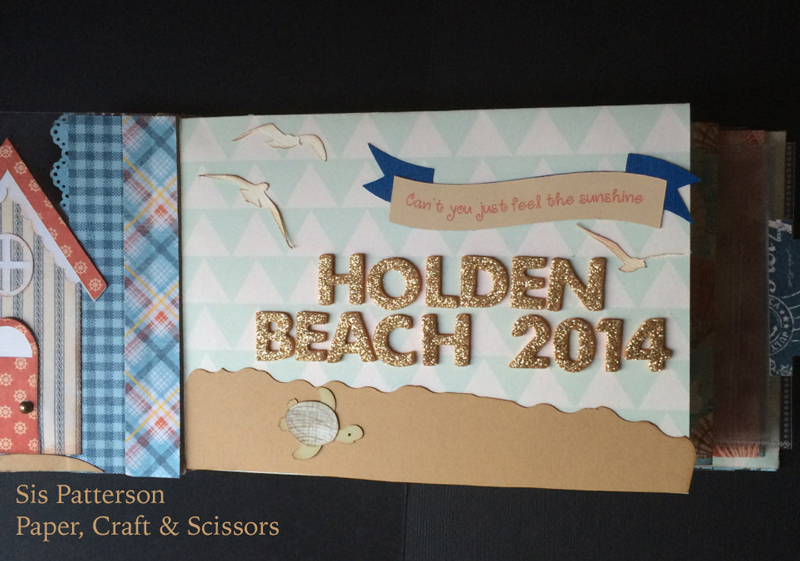 I primarily used Graphic 45’s Down by the Sea Collection. 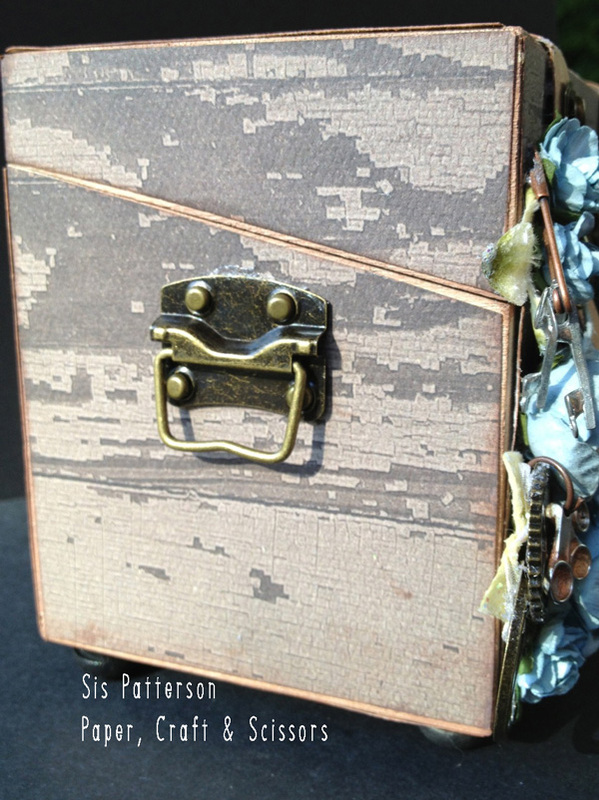 It has a two-inch spine and I added a Tim Holtz hanger brad to the spine before adhering the hidden hinge framework. Here is a close up of the front – the same little Cricut houses are used on the front and the inside front of the clear cover. The middle house is adhered on a layer of chipboard for some added dimension. I added a banner title and a little paper eyelet from a Martha Stewart border punch. My new Cricut Explore cut a lot of this project – I am still getting used to the clunky software, but the machine is awesome! The challenging thing about using acrylic sheets is determining what should go behind it and aligning it correctly. In this mini album, the next under page has a banner in the same place with the second line of the song. For the second type of page, I used strips cut from 12″ pocket page protectors and I added a paper “header” to attach to the hidden hinge system. When cutting your pocket page, make sure you cut below the line that forms the “stop” for the row above it. Once you get a pocket page in the trimmer, you will see what I mean. I used a bone folder to accordion fold one row of 4″ square pockets for one page and a row of 3″ x 4″ pockets for a second page. Here is how I added the header: measure the height of your row/strip of pockets. Mine measured 4.25″ tall. I cut a strip of paper 1″ wide by 9″ long. Along the long end, score at 0.5″ and 4.75″. Add ScorPal tape on the outside edge of your page pocket row along the side with the plastic header and holes for putting in a larger album with rings. Check your row of pockets to ensure that pockets are facing up. then tuck in the .05″ flap, and wrap your header band around the pocket row lining. Your pocket row should be attached to one side of your header band. After that, adhere it to your hidden hinge binding. Add a little pull tab to the side of your accordion folded pockets, and you are ready to fill your pockets. The last type of page is a flap page. With a 12″ piece of paper, cut a 4.75″ width of paper (so the design will run horizontal) by 10″. Score at 6.5″ and fold the flap. Cut another piece of paper that measures 4.75″ wide by 6.5″ and adhere on 3 sides leaving one end open for a flap. Adhere that paper underneath your flap. You can mix and match patterns to your heart’s content. A new year – a new recipe swap! This year, our 6″ by 6″ recipe cards use the seasons for inspiration. First up, winter. 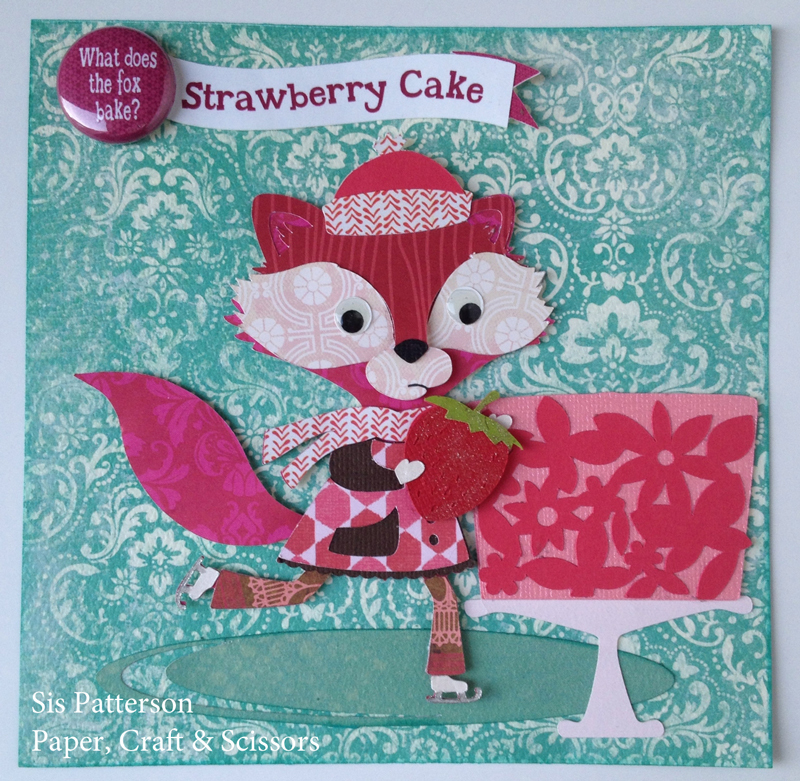 Here is my swap page – a skating fox with a strawberry and her strawberry cake. 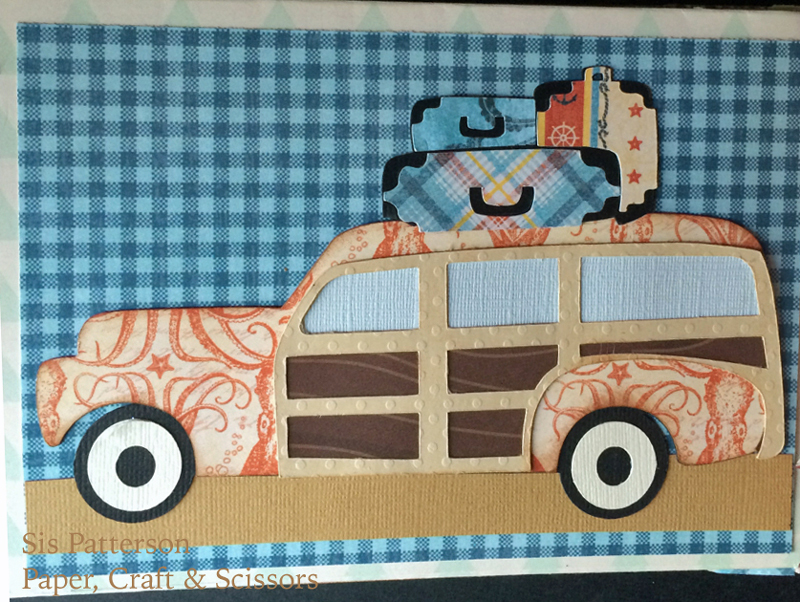 I used my Silhouette Cameo and much of its awesome software capability to make this card. 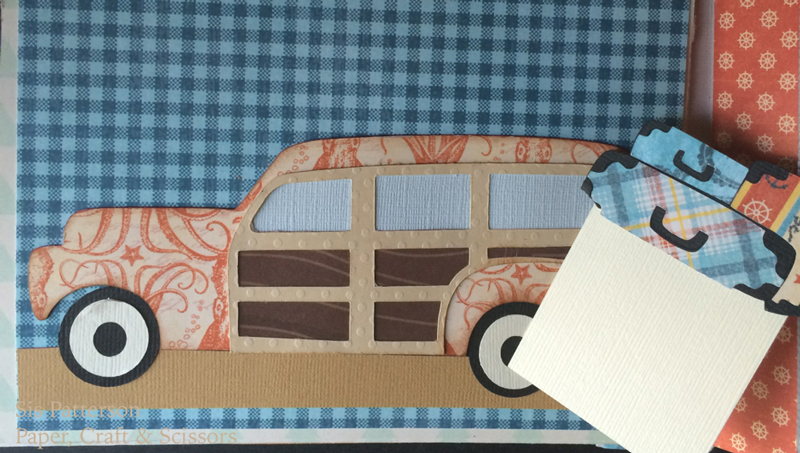 I love to mix paper companies and scale to make these little vignettes and this one is no exception. Papers from Authentique, Studio Calico, and Kaisercraft make up bits and pieces of the page. I also used my American Button Machine to add a little flair. 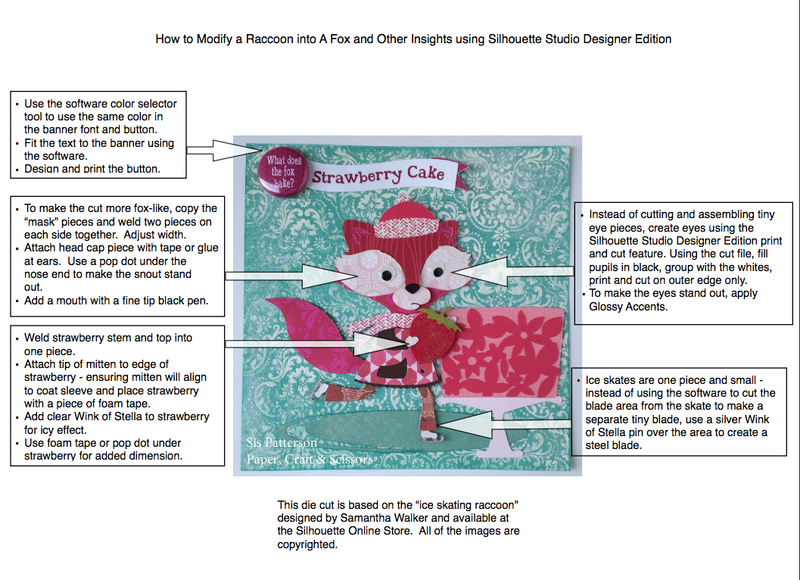 The fox started off as a raccoon in the Silhouette Online Store. I shared some of my techniques to modify her into a fox and add dimension (if you click on the photo, it is easier to read). 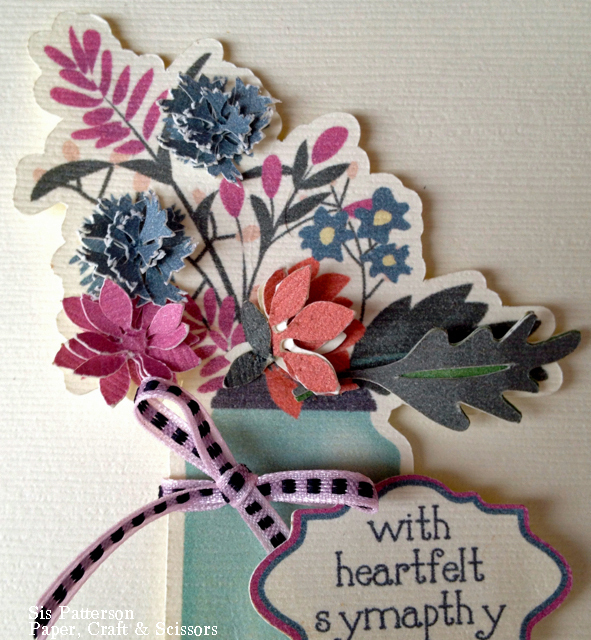 This is a card for a friend who unexpectedly lost her mother. Although I never had the pleasure of meeting her mom, I know she was an extraordinary person because her daughter is. 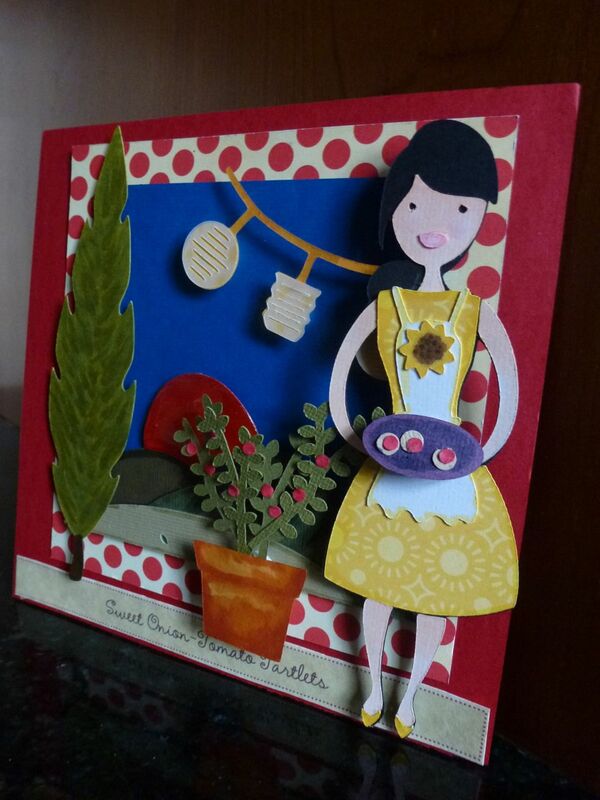 For this card, I used the color palette from the Carta Bella flower bouquet available at the Silhouette Online Store. This graphic uses Silhouette’s print and cut feature. I printed and cut the file at 3.6″ tall. To add a little dimension, I found some flower shapes and a leaf that were similar to the shapes in the print and cut file. I sized the flowers to fit over the Carta Bella blooms and then used the color selector tool (the eye drop) to fill the flowers with the same color. I printed all of the card elements at one time on the same Bazzill French Vanilla paper and then assembled. The flowers were glued on top of the respective blooms and “fluffed”. One of the flowers was folded in half for added dimension and to align better to the cut file. After tying a small ribbon around the cut file, I used foam tape to adhere the Carta Bella bouquet to a 4″ square of paper (using the same paper that the flowers and bouquet were printed). I also used the color selector tool to match the colors of the label and the font to the bouquet. After that, I added some layers to frame the bouquet and used foam tape to add a little more dimension to the dark frame. Here is a close up of the bouquet showing the flowers and leaf. 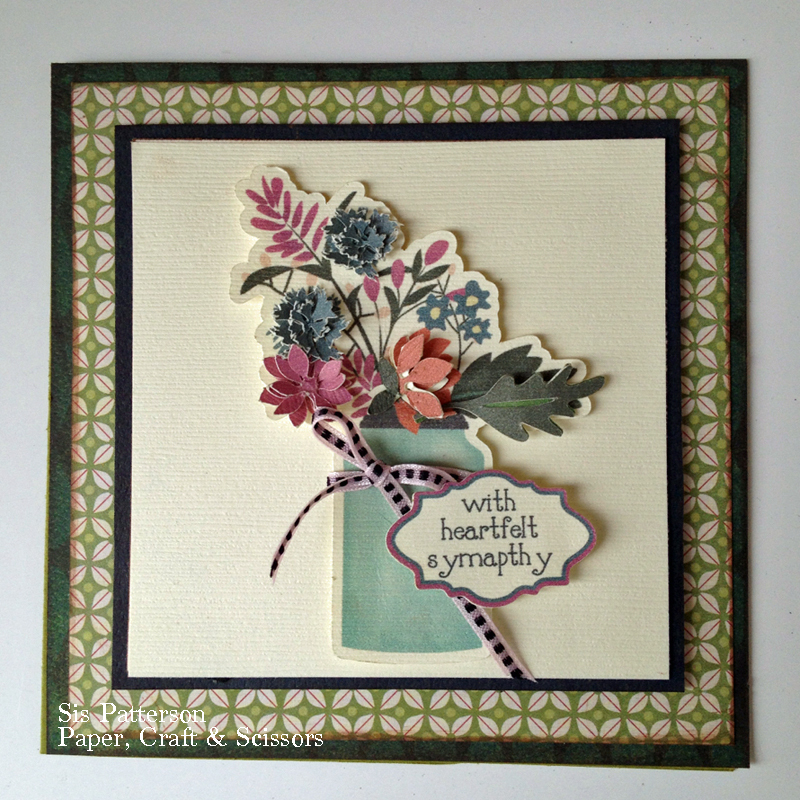 I intend to use this technique again particularly when working on a card where I want the design feature to stand out. A much respected and admired man entered hospice care a few days ago. This card is for him. The sentiment is from the almost last line in my favorite Irish blessing used on partings. I added three shamrocks to represent the Trinity and a Celtic-inspired background from My Mind’s Eye “Remarkable” collectable. All of the shapes are from the Silhouette Online Store and the font is SNF Picardy. Although I am very sad that is he is in hospice, I am very thankful for the nurses and doctors, like my friend Diane, who will make sure he is afforded the dignity he has earned and the care he and his family need. I debated posting the card on my blog. I thought it might provide some encouragement for someone looking for a hospice card or wondering if something as simple as a card could help. I hope it will. Well – there is not a lot of media mixing going on, but here is my first try. I used my Silhouette Cameo to cut the paper, my trusty Epson Photo R2000 for printing the “words” and some gesso, matte medium, acrylic paints, and stamps to create something to hang on the wall of a friend’s creative space (scheduled for expansion after her daughter gets married and moves out). The best thing about this type of project is you can cut and adhere your paper pieces with relative freedom because of the matte medium. I used a flowering dogwood branch, a heart, and some stars in a variety of papers. To get the branch properly aligned to fit the 4×12 canvas, I simply trimmed the branch apart and adhered the heart over the stem pieces. So there you have it – a first canvas. So – this is it – the final page in our two-year swap of 6×6″ recipe pages. I have learned a lot, and I have made some friends along the way. The background paper was the inspiration – even though it doesn’t have pears, it was the right palette for this project. I bought the “paper doll” .png file from Etsy at Cherry Hill Living. It’s easy to import a .png file to your Silhouette Designer Edition Software, add a “sticker” border (also known as an offset) and print and cut. If you want to know more, check out Jin’s tutorials and projects at Under A Cherry Tree. So after printing and cutting my tiny cook, I set out to make a little retro scene for her. A wooden spoon, a stove, a few pots, and a pumpkin pie are all from the Silhouette Online Store. For the stove, I added the pots and welded them to the background shape. After cutting the background in black, I adhered the pie and a little oven rack to the background. Next, I hand cut the vellum oven front and adhered it behind the stove. After that it was a simple as adhering the layers. The little dish towel is hand cut and draped over the oven door handle. A few little brads for knobs and the recipe title made the scene complete. To add some dimension and emphasize the retro feel, I cut a frame from black cardstock and sandwiched in a piece of clear acrylic and popped it up to make the little diorama a little more retro. I have some ideas for new projects and hope to be back soon. 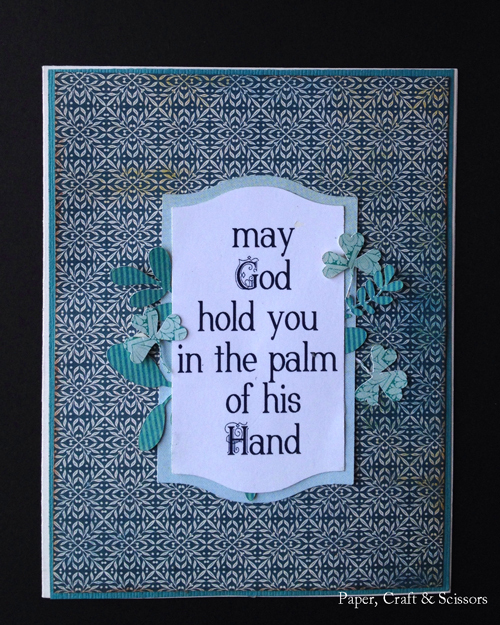 Until then – happy papering…. I recently participated in a partnered recipe box swap with a group recipe card swap. Each participant made one box for a partner and one recipe card for each member of the group of 35. At the end of the swap, each participant had a decorated box and 35 holiday or winter sweet recipe cards to fill it. 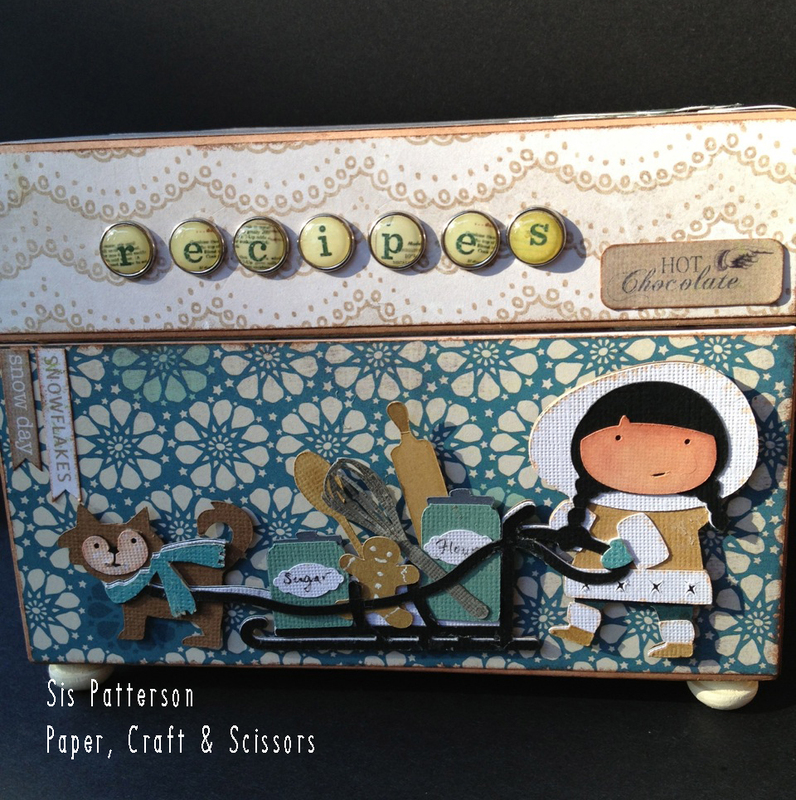 Box 1 above used Bo Bunny papers and Lettering Delights’ “Eskimo Pie” collection. I added a few cut files from the Silhouette Online Store to add canisters, tools, and a gingerbread cookie to the sled. The “recipes” title brads are from Farmhouse Paper Company. On one of the sides, I used another cut from the Eskimo Pie collection and cut off the fishing pole and replaced the fish with more gingerbread men. As I did on the front die cut, I used my Copics to add the skin tones and fur texture and a Uno Signo-Ball white pen to add the icing details. For the second side, I used Lettering Delights “Jan’kufuudo” cut set to add the hot chocolate mug. 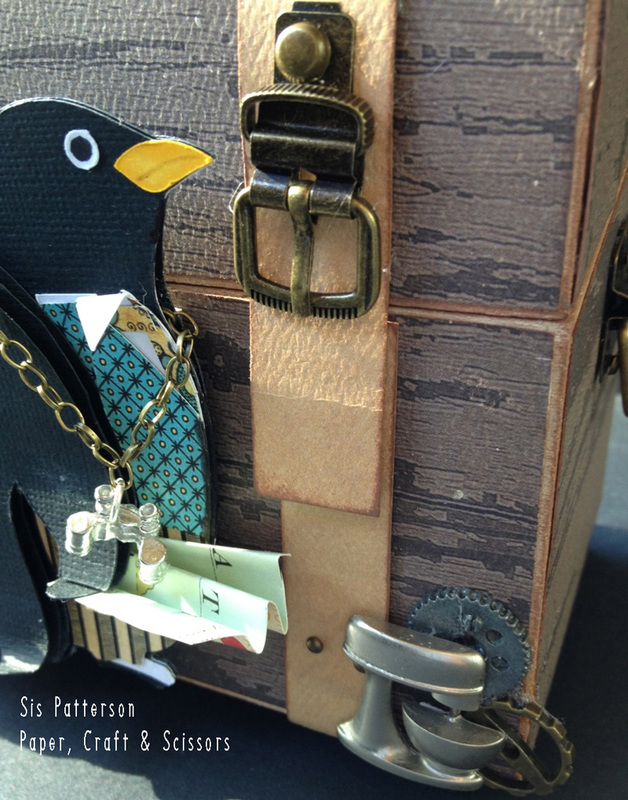 Box 2, below, is a winter steam punk trunk with an adventurous Echo Park penguin from the Silhouette Online store. 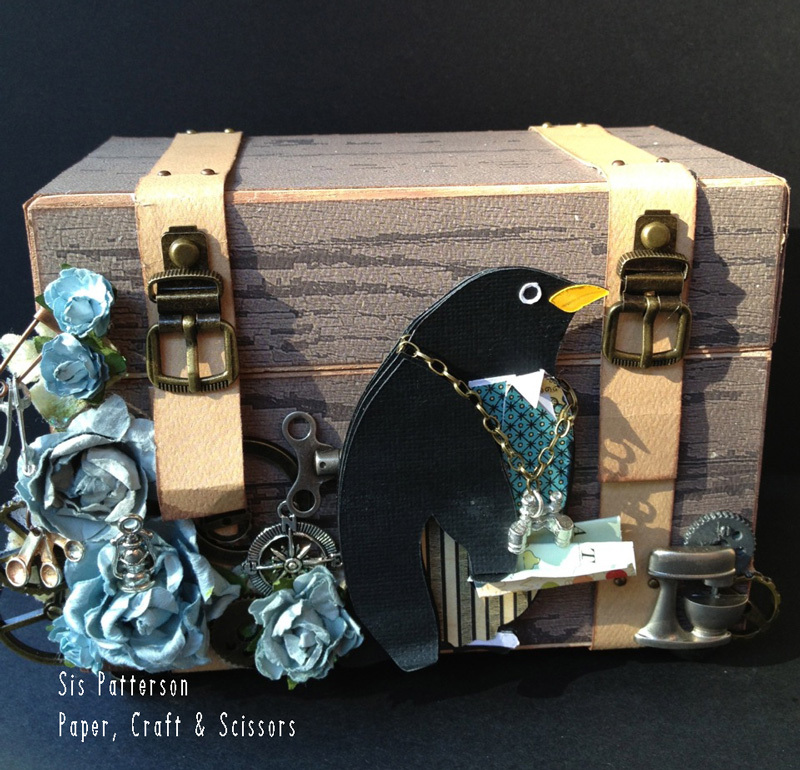 I cut several penguin layers in different patterned papers to create his trousers, vest, and cravat, and shirt and then hand-trimmed to make him the little gentleman penguin that he is. I purchased his vintage doll house binoculars from Etsy and added a chain. 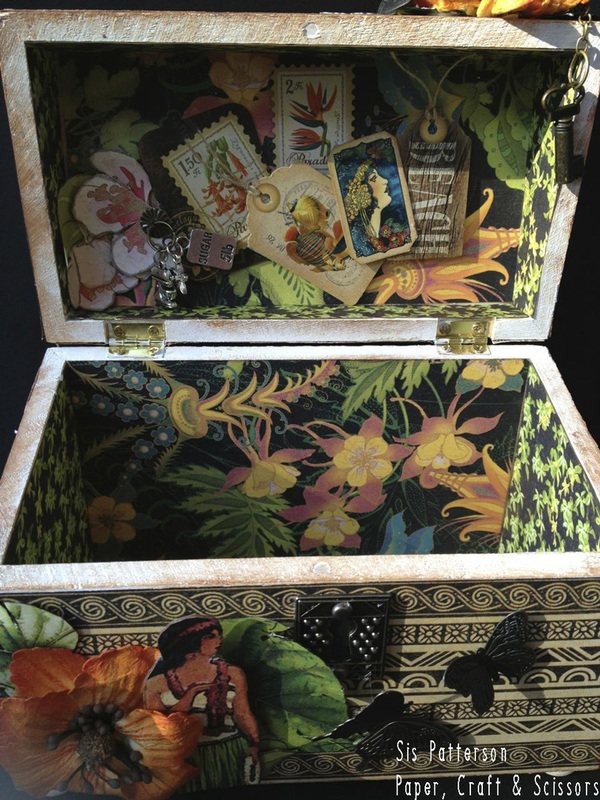 The trunk features Tim Holtz buckles, brad nails, and Theresa Collins paper. I added Prima flowers, kitchen charms, gears, a clock key, and a mixer from the Farmhouse Paper Company Kitchen metals brads to finish the box front. The penguin’s map, of Antarctica, is cut from an October Afternoon 12×12 map page and folded. Metal handles from Kaisercraft are adhered to the sides of the trunk. 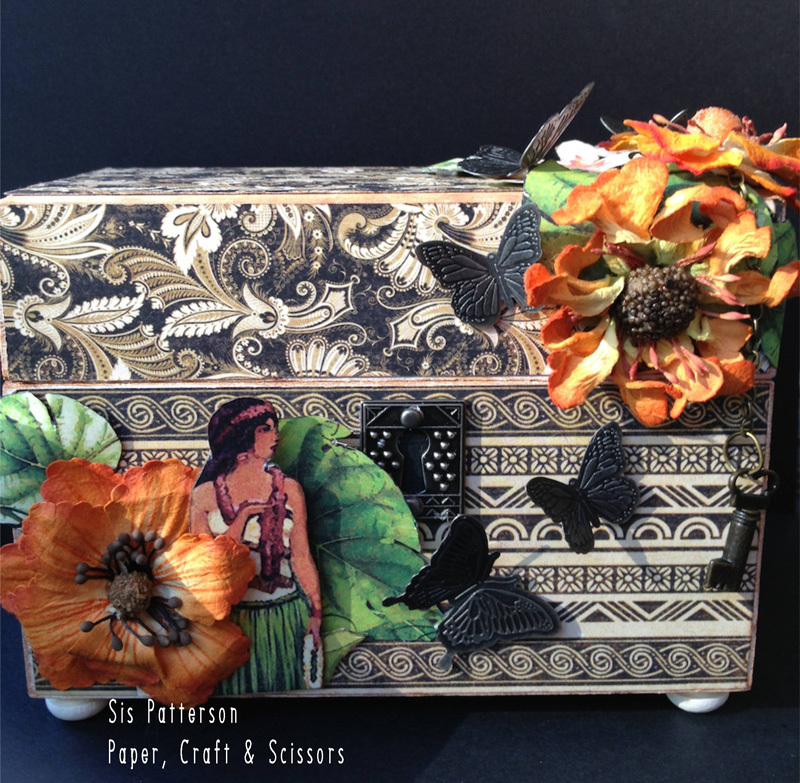 Box #3 uses Graphic 45’s Tropical Travelogue and Prima flowers. I also added some metal butterflies, a lock, and key to add a little more G45-like elements to the box. Most of the design elements were hand-cut from 12×12 paper. I learned that it is possible to fold the metal butterfly wings up to add a little more dimension. The inside of the third box is the most interesting of the three and included several layered G45 elements adhered on chipboard for added dimension. The boxes I received in return are amazing. Many thanks to my friends, Esther, Amy, and Ashley, for the beautiful boxes that each made for me. 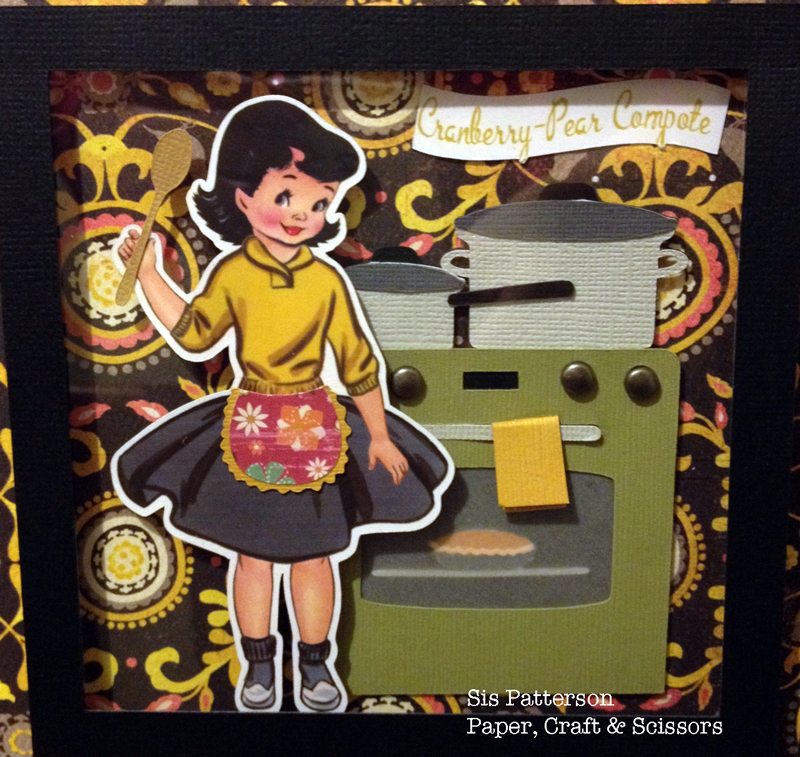 Another 6″ by 6″ vignette for the recipe card swap. The theme for this round was 4th of July. I used Cricut’s “Yee Haw” cow girl as the focal point and substituted a hand cut tortilla chip for her hat. The bowl (formerly of popcorn) is from the Silhouette Online Store. 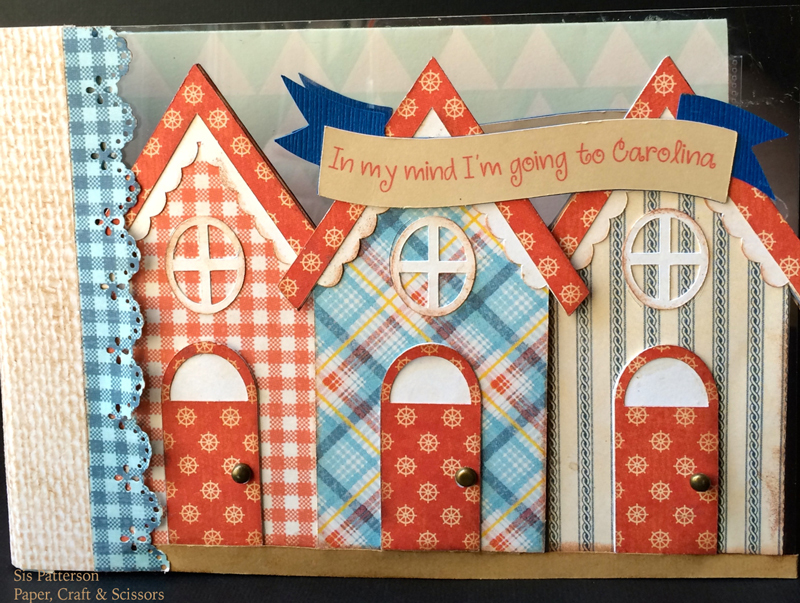 I used the Silhouette Designer Edition software to cut the five-pointed star in blue gingham and then add more cut lines to the star cut and split the red patterned paper points in half for a little extra dimension and color. I simply added the red pieces directly over the top of the blue gingham points. I used Copics to add the color for the Texas caviar (black beans, black-eyed peas, red and green peppers, and shoe peg corn) and added a second hand-cut tortilla chip. 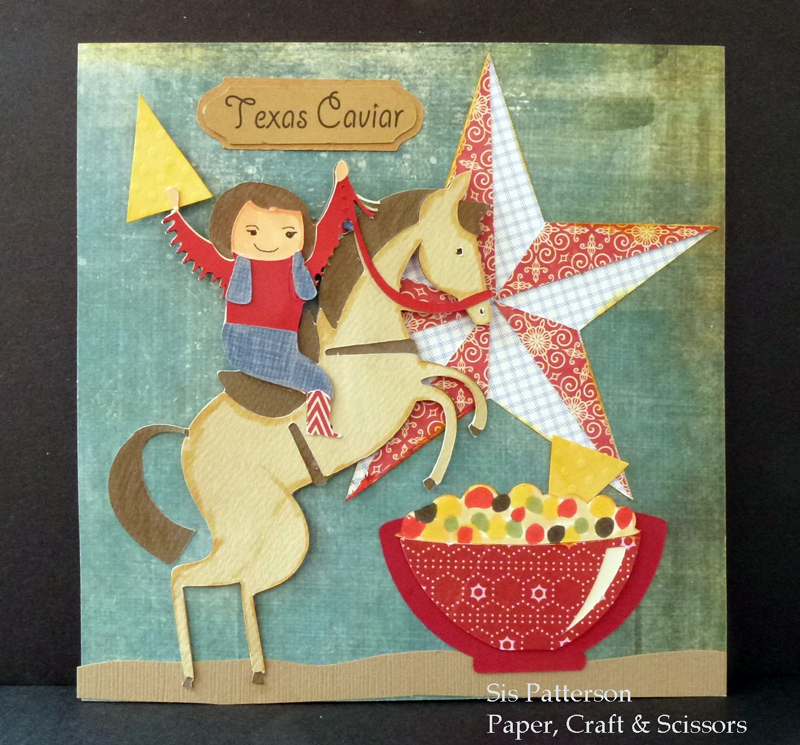 Silhouette’s Print and Cut capability was key to making the recipe title label, and the Cricut Craft Room was instrumental in hiding contours on the cow girl. When working with small pieces, I generally “hide” the eyes and mouth as it is simply easier to draw them in. The ground was also hand cut. 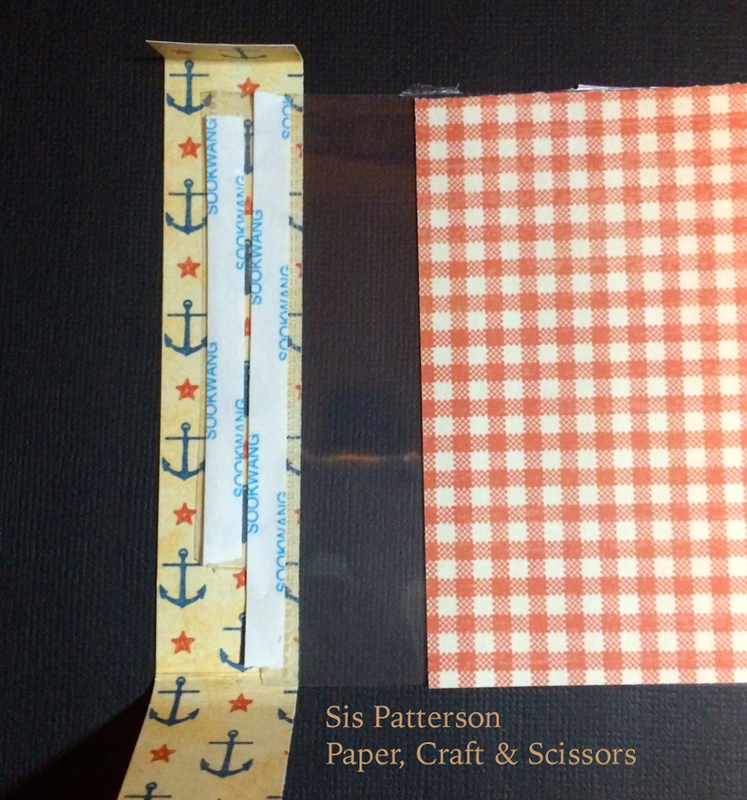 Using scissors, just cut a wavy line about a half-inch up from the end of a six-inch wide paper strip. Next, cut a straight line across about a half-inch above the wavy edge. You will have two “ground” pieces and it is simpler and easier than using a machine. 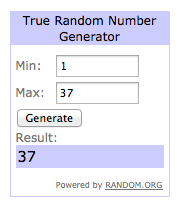 The winner of the $25 Simon Says Stamps winner from the Christmas In July Blog Hop is Carolyn. What a fabulous addition to your Christmas decorations! This is a wonderful ‘timely’ holiday project! Thank you for the directions! Thank you, Carolyn and everyone who stopped by. I hope to see you again.